"A sweet and protein-rich dessert hummus you can eat chilled by the spoonful or serve with my recipe for homemade cinnamon-sugar pita chips." 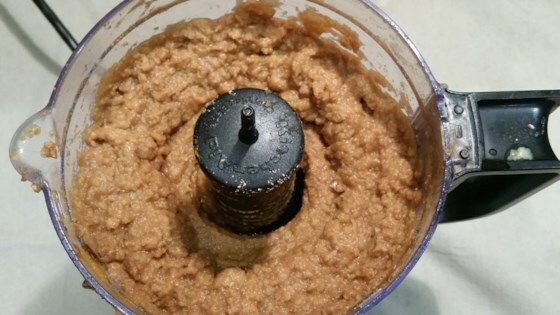 Combine chickpeas, pumpkin, dates, maple syrup, peanut butter, ginger, molasses, vanilla extract, cinnamon, cloves, and nutmeg in a food processor. Process to a smooth paste, 2 to 3 minutes, scraping down sides as necessary. Refrigerate 1 to 2 hours before serving. Feel free to use your preferred nut butter.